Kombucha, the mother of all hipster drinks, even cooler than matcha latte with coconut milk, has made a much-welcome entry to Delhi. What's basically fermented tea, Kombucha, apparently has a ton of health benefits. And while I'm hopeful I reflect these, it's definitely not the reason I spend five-diet-Cokes worth of rupees on one glass of this drink. What I love is the taste—it's like having really nice, non-alcoholic, spiced sparkling wine. Pour yourself a glass, top it up with ice, and you're good to go. The go-to brunch spot of the hour, Fig & Maple sources their Kombucha from Krishi Cress (another really cool company you should keep an eye out for). I like their variant the most; it isn't too tart or bitter, actually tastes 'floral', and is the perfect accompaniment to one of their signature egg dishes. My new favourite spot in Gurgaon, Cafe Shunya kills it (not literally, of course) with their organic and vegan food. Their house-brand Kombucha is tart AF, and a little extra ice goes a long way. Have this with their pulled jackfruit burger, or their vegan waffles. A recent discovery, Fab Cafe's kombucha comes in three iterations; nimbu, raspberry and chia seeds, and a mango one as well. I tried the nimbu one, which I really liked. All of FabCafe's food is fabulous, so knock yourself out. They've got three outlets in Vasant Kunj, Lajpat Nagar and Gurgaon. I hear Greenr in Vasant Vihar also has great Kombucha—I'll be trying it as soon as I can. 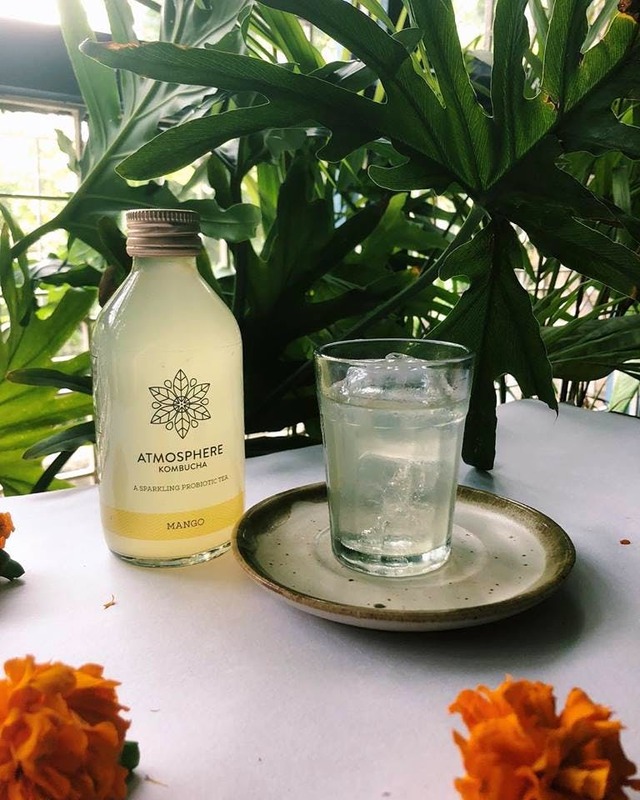 Atmosphere is a brand that delivers fresh, bottled kombucha to your home, but you need to order a minimum of four. Other than that, they also retail through multiple eateries all over in Delhi. For a list of that, you'll have to check their website.